Years ago, I had the privilege to work for Ev Mann of the Center for Creative Education. At that time, their headquarters were in Stone Ridge, NY. Coming up from New York City as a musician with a background in Production Management, it was my good fortune to have seen their ad for someone like me to assist the Administrative Director, Mary Farel. Those couple of years were two of the most fulfilling in my professional life. Although Ev has had close ties working with the children and schools in the city of Kingston, he moved his operation from Stone Ridge into Midtown back in 2005/2006 where he continues to bring music, culture, dance and drums to the youth and families in our area. On Friday night (4/30) The Center for Creative Education in partnership with Active Voice and Participant Media bring a FREE screening of the ever important film FOOD INC to UPAC in the city of Kingston. Click on this LINK to see the flyer for this event. On the ground, we are witnessing alarming numbers in childhood obesity – yet at the same time, 1 in 8 children will go hungry each and every day. It’s critical that as a community, we work to change our daily habits. In Kingston, every one of our schools (and I believe there are 14) will have some form of garden in them. That’s a huge accomplishment that has taken place in just two years time. Gardens are the buzz word in Kingston. Let’s continue to nurture them and encourage our children to get growing at home and at school. Take your family and visit a local farm, and pick something fresh off the vine to taste. With all the current infrastructure problems in the city of Kingston, I thought this informative meeting was important to post – as is. Hi everyone this is Victor-Pierre and on behalf of Clearwater and The Hudson Valley Regional Council I would like to invite you to our Green Infrastructure (GI) Community meeting to discuss Green Infrastructure Planning. I have had the privilege of meeting most of you at recent training in Kingston on Green Jobs and at the Climate Smart Community Pledge meeting and was excited that you expressed interest in attending our GI community planning meeting. Hope to see you soon. The Hudson Valley Regional Council (HVRC) is implementing a green infrastructure (GI) planning project in Kingston and six other communities in the Hudson Valley region in New York State. In each locale, community-based teams, guided by our community outreach leaders, will participate in site assessment training workshops, public outreach and the planning of 10 concept projects at promising sites. 1. In Kingston we want to build the capacity of municipalities, their consultants and other local stakeholders to understand, plan for, implement, and maintain GI practices. 2. We will develop an inventory exisitng GI demonstration projects and identify the potential for expanded GI projects and sites, including at least 10 detailed conceptual plans in each of seven selected communities in the region. 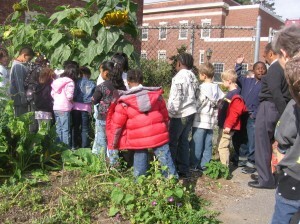 The children from the GW Montessori Program in their garden! 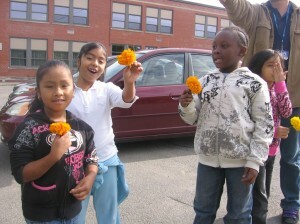 GW Montessori Public School gets its garden on! Kudos to Valerie Hannum and the The George Washington Montessori School. Of all of the percolating ideas and efforts in the city of Kingston, Hannum and her program to us is in the ‘pinch me’ category. How lucky that she has landed here. With only approximately 200 public Montessori schools in the US and Canada, to have one in our community and particularly in the heart of Midtown is no small thing. Soon, ours will accommodate grades K-5. Generally, a Montessori eductation is costly making it impossible for most families to pursue. Here, the program is covered by grant money and ultimately, as a public school by our taxes. Imagine that. Paying school tax and actually using the schools. Of course, we realize that there are some parents who feel the program isn’t suited for their child. But the GW Montessori School is a great option to have. To force a mandated public education on every young mind is not a healthy approach. A special thanks to Gerard Gretzinger, Robert Pritchard, and all of the GW Supporters who recognized a good thing. Most of all, to the staff and teachers (some who have served the community as educators for decades and who come out of retirement to teach in this new way) that have taken between 1200 – 1800 hours of study to become certified Montessori teachers. Reach out to Valerie Hannum (845/338-1978) and ask for a tour of the school to see for yourself. Perhaps one day, more of our public schools will have the same approach. Read about the program in Today’s DAILY FREEMAN. The Everett Hodge Center on Franklin Street in Kingston has always been an important place to us. Almost in the heart of Midtown, it works hard to service and run programs for the children and families living in Ward 4 and beyond. 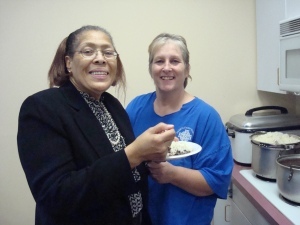 Every Friday night, Ward 4 resident Jeanne Edwards helps to organize a healthy warm meal for the children as part of the “Hodge Food For Thought/Rewards For Excellence” program. They are always in need of healthy food donation as well as volunteers. Visitors and presentations for the children are a great gift, and always welcomed. Visit their BLOG for weekly posts, and contact information for more on the program and how you can help. By the way, the 5th Annual Midtown Make A Difference Day has been set for June 19th from 11am – 4pm at the Hodge Center. If you wish to learn more, contact Megan Weiss (Kingston Cares) at 845/331-1110. Today, I received the agenda for the Finance Economic Development committee from Ward 1 Alderman Andi Turco-Levin (who also has a seat on this committee). The meeting takes place tomorrow. The agenda link is posted below for any citizens interested in participating. The Safe Routes to Schools and Parks Committee of the Healthy Kingston for Kids Project seeks adult and youth volunteers for a GPS mapping project that centers on conducting walkability assessments in area neighborhoods. Volunteer training workshops are set for Saturday, May 1 at the Forsyth Nature Center from 11:30 a.m. to 1 p.m. and on Friday, May 7 at Hutton Park from 5 p.m. to 7 p.m. The workshops are free, but registrants are expected to use the knowledge gained to conduct at least one 1/2-mile walkability audit with GPS in a Kingston City School District neighborhood. To register for the workshops or for more information, contact Kristen Wilson at 845-340-3990 or email kew67@cornell.edu. Click HERE to download the registration form. The City of Kingston will hold a Ribbon Cutting Ceremony on Broadway to signify the installation of Mr. Big Belly Solar Compactors and dozens of Bicycle Racks along the Midtown Broadway Corridor. These streetscape improvements were made possible through the NYS Main Street Program, administered through the Rural Ulster Preservation Company. This funding has allowed the City of Kingston to improve amenities along Broadway with the purchase of 4 solar powered trash compactors and recycling units. Kingston will be one of the first cities in New York to purchase and implement these unique waste handling systems. Over time, these units will decrease the number of trips necessary to empty refuse along Broadway, while working to beautify the Midtown Area. Representatives from Direct Environmental Corporation, makers of Mr. Big Belly will be on hand to demonstrate the units and answer questions. Funds were also use to purchase bike racks, which will be placed along Broadway this Spring to encourage more Kingstonians to bicycle to and from residences and businesses along the Broadway Corridor. RUPCO worked closely with the City of Kingston and the Green Corridor Project, which includes representatives from Sustainable Hudson Valley, Kingston Parks and Recreation Department, Mid Hudson Energy Smart Communities, RUPCO and numerous environmental professionals and Kingston residents to make this project a success. The Green Corridor Project aims to link environmentally minded businesses and institutions along Kingston’s main thoroughfare to attract and encourage a green economy in Kingston. The Forsyth Nature Center will celebrate a very special Earth Day this year with Karen Pillsworth, Kingston’s Storyteller Laureate. Karen’s vibrant and energetic telling of stories for the earth will inspire audiences of all ages. All participants will receive an Earth Day gift of a tree sapling donated by the Friends of Forysth Nature Center. This event is free and weather permitting. For more information, you can call 845-481-7339 or visit the Forsyth Nature Center’s website. A spring clean-up of litter lying along the newly instituted “Kingston Corridor” will take place on Saturday, April 24, 9 a.m. to noon. The Kingston Clean Sweep is being sponsored by the Friends of Historic Kingston with support from the City of Kingston and more than 20 other local business and service organizations. The city will be divided into eight sections, each overseen by one or more of the participating organizations. Volunteers will be provided with City-supplied trash bags that will be collected by the Department of Public Works following the event. People are asked to bring their own work gloves and a broom, if possible, to sweep dirt piles from the sidewalks. The event will take place rain or shine. Volunteers are still needed in several sections along the “Kingston Corridor” which runs from the Thruway Circle down to the Rondout Creek. Anyone who wishes to volunteer can call the Friends of Historic Kingston at (845) 339-0720 or e-mail fohk@hvc.rr.com . KingstonCitizens.org is helping Queens Galley in their effort to raise funds for a new stove that they desperately need. Can you make a donation of $5, $10, $20 or more? Let’s help Diane to feed families in a crisis. Click on this LINK to donate. “The oven at the Queens Galley Soup Kitchen in Kingston has finally given up the ghost. After many MANY years of reliable service and the last few years of unreliable service and often repairs it has become unusable. If you could please help us raise the funds we need to replace our very much needed range it would be appreciated! You can donate online or send a check made payable to Queens Galley to 254 Washington Ave Kingston NY 12401. 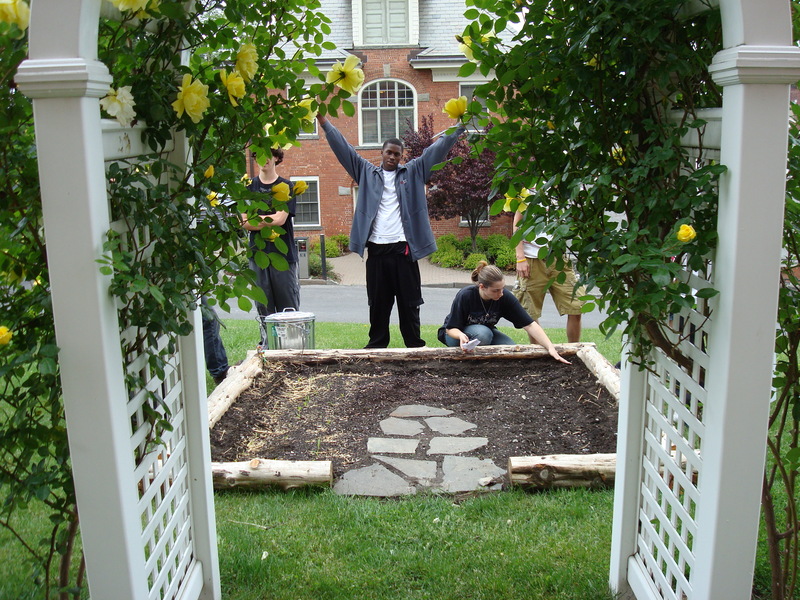 Today at 1:00pm (4/17) there is a square foot gardening presentation at the Kingston City Hall garden located on the Northwest side of the building. Jesica Pascual who was once a farmer at Phillies Bridge Farm will lead the way. Though wet, it’s a really nice day to be out in the garden. I know because I just came in from mine. You can read the press release by visiting the Kingston Victory Garden Yahoo! Group (and if you are a local home gardener you might wish to become a member of the group as well). We will also cut and paste it below. Jesica Pascual, volunteer garden manager of the City Hall Victory Garden, will lead a free workshop to on square foot gardening this Saturday, April 17 from 1 p.m. to 2:30 p.m. The garden is located on the west side of City Hall, which is located on Broadway across from the Kingston High School. The workshop is designed for anyone looking to learn square foot, or French intensive gardening, which allows gardeners to grow the maximum amount of vegetables in the minimum amount of space and is perfect for backyard (or front yard!) gardens. Square foot gardening is the method being used this year at the City Hall site as a way to encourage residents to grow their own food. “Using this method, it is also easy to incorporate beautiful flowers and landscaping elements such as trellising and decorative borders,” Pascual said adding that she will cover the basics in setting up a garden plot, planning out the space and where to get high-quality ingredients for soil as well as seeds and transplants. At the end of the workshop there will be a short swap and share session where fellow gardeners can swap seeds and share resources – so please bring your extra or leftover seeds. For more information, contact the Kingston Land Trust at Kingstonlandtrust@yahoo.com. For some time, I have not only been impressed by KURA (Kingston Uptown Residents Association) but am ever so grateful to have smarts like that on the case of some very pressing issues here in the city of Kingston. They have successfully hosted meetings to expose residents to important information while tackling the complications of such topics as Kingston’s Nuisance Abatement law, the city’s budget and the confusion of our citywide reval and tax structure. I had the great pleasure to meet and listen to Gerald and Victoria at Ward 1’s community meeting this past February (by the way, if you haven’t yet seen Ward 1 Alderman Andi Turco-Levin’s blog yet, you must. She is doing an exceptional job at City Hall and in reaching out and listening to her constituents. I highly recommend you bookmark her BLOG.). On Tuesday, April 20th KURA will host another public information meeting at the Old Dutch Church in Kingston (272 Wall Street) on “How To Appeal Your Property Assessment”. Guest speakers will be Ken Brett, member of the City of Kingston Board of Assessment Review and Mark Grunblatt, Real Estate Attorney in Kingston. Of course, it must be noted that KingstonCitizens.org learned of Karen Vetere during the now defunct homeowners tax relief group meeting back a year or more ago. Before and since then, Karen has been extremely helpful in working with residents through the maze of making sure their house values and tax increases were correct. There are many who experienced a doubling in their taxes over the course of a year, almost taxing them right out of their homes in one fell swoop. In fact, it’s still a real possibility as things currently are. 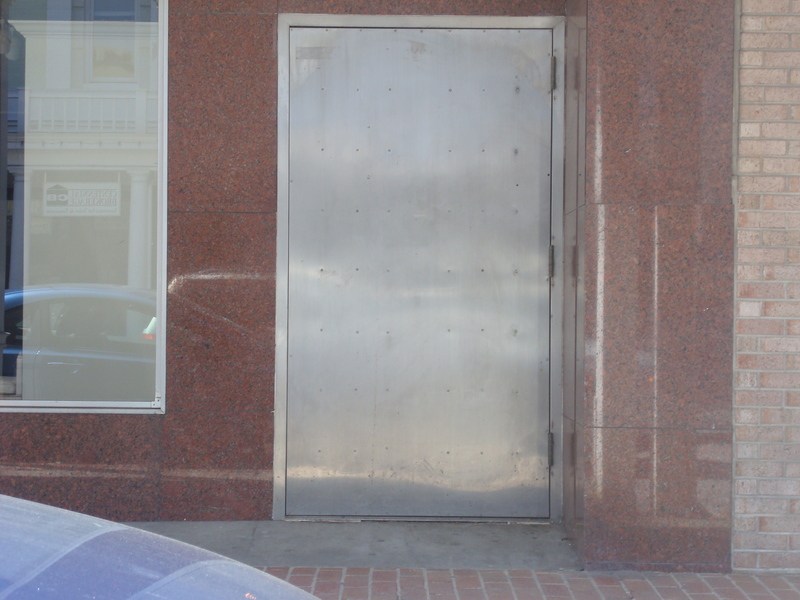 Sometimes, the city of Kingston officials seem to work against its citizens with a lack of good planning. That’s not to say there aren’t good people working in city government. What I’m trying to get at here, is that in order for this all to work as it was intended, the citizens need to take an ongoing active role in it all. When it doesn’t work the way it should, it’s partially due to our lack of involvement and oversight. We need to be paying close attention now and we need to stay the course on whatever issue calls us. Constructive changes don’t occur overnight. Thanks to those mentioned in this post, and to all of the citizen groups new and old who are working to make the city a cool place to live while trying to incorporate every single one of it’s residents in its rich and diverse community. How About a Little De-Tagging During the Citywide Clean Sweep on April 24th? In the spirit of the upcoming citywide clean sweep event on April 24th, KingstonCitizens.org is giving away ten “Team D’Arcy De-Tagging Kits” that include spray paint remover, rubber gloves and a full roll of paper towels (towels courtesy of Kingston Natural Foods). The first ten residents to arrive at the citywide Neighborhood Watch Meeting on Tuesday, April 13th at the Kingston Library will be given one. I’m going to keep a kit in the car to remove tags when I see them. How about you? AFTER: Citizen and community leader Michael D'Arcy takes matters into his own hands and removes blight from our Uptown business district. It's easy for us all to do. Kingston Neighborhood Watch Flyer. Print and Distribute! Next week may be one of the more important meetings that I have seen organized since my time being active in community work (back in 2006). Thanks to the D’Arcy’s, the citizens have a solid opportunity to help become a part of a positive solution for the safety of our community. 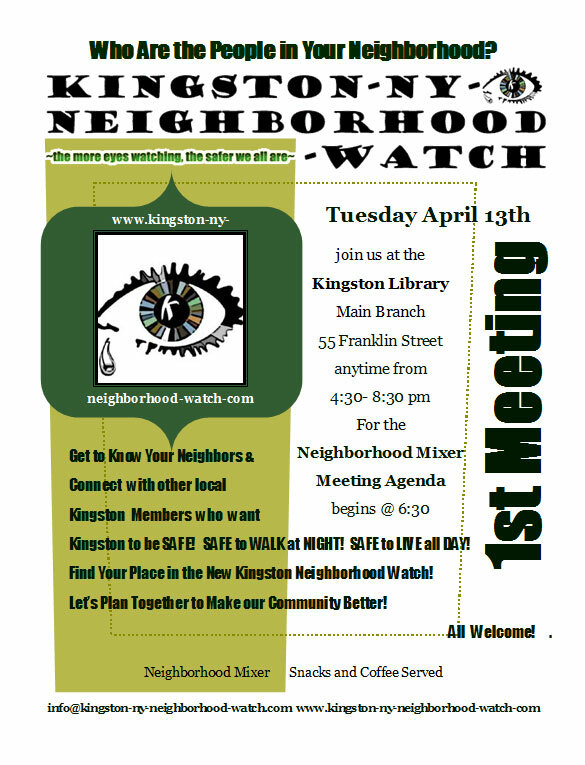 The first citywide Kingston Neighborhood Watch meeting will take place on Tuesday, April 13th at the Kingston Library, 55 Franklin Street. There is a mixer from 4:30pm – 6:30pm. The agenda begins at 6:30pm to 8:30pm. We really need everyone to help get the word out. Can you commit to help by printing out the attached flyer to share with a dozen neighbors? There will also be an opportunity for a last door to door with Ward 5 Alderman Jennifer Fuentes Saturday, April 10th. Citizens are asked to meet at Deisings on Broadway at noon. You can read her announcement at the Ward 5 Yahoo! Group. Ward 7 Alderman and Majority Leader Bill Reynolds. Below is his state of the city report read on April 6th, 2010. If you have any thoughts or feedback, please use the Ward 7 Yahoo! Group that Alderman Reynolds is a member of. Public service is an honor for anyone privileged enough to have been chosen by the voters to represent them. The aldermen here tonight together in this great room with Alderman-at-Large Noble and officials who work in an appointed capacity have lately been particularly honored by the public to serve, because we were elected in the midst of what many are calling the Great Recession. The voters chose us to do the hard work for them, and to do the best we can on their behalf. That is why I am here to tell the people of Kingston that – we hear you. We understand your fears and concerns. And we will continue to listen to you because we who sit at these desks every month to make new laws and pass budgets don’t have all the answers. We need your help and your input to make Kingston a better place. Times have been tough, for sure, and they will continue to be difficult for the remainder of the year. We are committed to keeping a sharp eye on the bottom line and to make the best use of taxpayer dollars – and we are prepared to make the tough decisions required to keep living and doing business in Kingston as affordable as possible. We are walking a tightrope for sure – but as long as we remain steady and as long as we keep our heads up, we will make it through this recession. We need to rectify the safety net inequity that Kingston shoulders. We need to continue to hold the line on property taxes and ensure that taxpayers are being assessed equitably. Bearing that in mind, we urge the school district to do the same – a 12 percent school tax increase is unsustainable. On the heels of the ongoing success of the URGENT task force, we signal our support for the new block-by-block sweep program designed to clean up bad influences that pollute and destroy homes and neighborhoods. We need to focus on getting our act together now, ahead of an economic upturn, by re-focusing on the basics: cleaning up the city, cracking down on crime and blight, and cutting back on a cost structure that’s outgrown our ability to pay for it. We must continue to focus on the inequity of our “homestead/non-homestead” tax policy, which is steadily eroding the city’s commercial tax base and private-sector job market. That being said, the immediate source of distress for many taxpayers has been the property revaluation process that was first conducted in 2008. While serious flaws and inequities were apparent in the results produced so far, this is a problem that can and will be corrected with a new revaluation. Speaking of inequities, we had to learn quite by accident that Kingston was paying social services costs for people not living in Kingston. And, while we look forward to the mayor working together with the county administration to be sure the city is reimbursed for lost taxpayer dollars, we remain committed to auditing future claims, and will work together with the city and county comptroller as this process unfolds. This is terribly important, given the cost – $1.2 million in safety net spending this year, up from $400,000 seven years ago. Not only do we take in the county’s disadvantaged, we take on the entire local portion of the bill. We remain committed to sustaining an infrastructure that up until recently seemed to be crumbling every week. And, though we have allocated substantial sums to guard against infrastructure decay, we will continue to be sure our infrastructure meets our basic needs. Bankruptcy is not an option for Kingston, for a whole host of reasons not the least of which such a move would require state legislative action and, quite frankly, you have to be bankrupt after all to declare bankruptcy. Kingston is still well below its tax and bonding limit, although by no means are we in a position to brag about such a thing. But to declare bankruptcy, as I have said publicly, would be equal to raising the white flag. That said, the financial situation we face remains serious. Correcting it will depend on how we approach labor contract negotiations. And while we are pleased two out of three of our unions provided give backs for the 2010 year, we may still need to work with them to be sure we’ll be able to provide required services to the people while holding the line on taxes as we work to assemble a 2011 budget. The mayor has indicated he will include members of the Common Council in discussions and negotiations with the three unions. That’s the right approach. Some of the things we could look for would include new flexibility in the way departments are staffed and job responsibilities defined, with a particular emphasis on putting more police officers on the street at critical times each day, and cross-training more firefighters to act as building-code enforcement teams during otherwise idle periods. We will need to look at realistic contributions by employees toward their health-care plans, recognizing that we must work together to reduce costs. We just received word, for example, that the premium increase for the Empire Plan for 2011 may be more than 13 percent. This is not a happy or uplifting speech, I know, but there are times that require us to set aside happy talk and speak to stark reality. That also means making the hard decisions. When you say you want to cut costs, you have to mean what you say and follow through on your words. Cutting costs isn’t easy and it isn’t painless. You have to back up your words with action, otherwise the things you say and the promises you make will sound hollow and broken. That isn’t to say I’m not optimistic about this city’s future. I have always and remain very optimistic that Kingston will one day reach its full potential. When the cost cutting is over, we will need not only to streamline government but aggressively market this city so we can continue to brag about it being one of the top art destinations in the country, as not only one of the more affordable places to live in the region, but a place where several types of architecture: beginning with stone houses, through all the great design eras – all exist in one place. We need to continue to show the world what sets Kingston apart from so many other places in the region. We will work together with a vibrant group of citizens organizations such as the nascent Kingston Digital Corridor, KingstonCitizens.org, Friends of Historic Kingston, the Business Association of Kingston, ASK, the Neighborhood Watch group, and KURA just to name a few. We were happy to listen to and work together with our business groups in establishing the Main Street Manager, embodied by Nancy Donskoj who has done an excellent job showcasing our city’s assets and opportunities. I am convinced that with the right combination of marketing and a more sensible tax structure we’ll be able to move this economy forward. We have some way to go for sure, but Kingston has been through tough times before. We’ll get through the Great Recession and be stronger and smarter when it’s over. We have created a two part posting to share both the majority and minority leaders state of the city reports for citizens who were not present this evening. We’ll begin with minority leader and Ward 1 Adlerman Andi Turco-Levin (R). This was her state of the city address presented on Tuesday, April 6th 2010. If you have any thoughts or feedback, please visit the Ward 1 Yahoo! Group where Alderman Turco-Levin is a member. Mr. President, my fellow Council Members, and to all of you here tonight, we want to thank you for this opportunity to share our hopes, visions, and recommendations on how we can move our City forward. Let’s also take a moment to recognize the hard work of our police and firefighters who keep us safe, to the volunteers of this City who keep our kids off the streets and out of harm’s way from gang violence and drug dealers and also to the private citizens who work to unite our communities. A heart felt Thank You. As you know, we are currently forging through very difficult times, not only from an economic point of view but from a quality of life standpoint. What I hope to outline here tonight is a way for us to recognize how we got here, what we can do to prevent us from continuing in the same direction, and what we can do in order to steer our City towards growth and economic stability. As with any journey, a roadmap is the key for success. It outlines boundaries, and allows you to navigate a course to reach your final destination. We have no roadmap. The fact that Kingston has not had a complete comprehensive plan done since the 1980’s is evidence. From one side we wish to welcome development, yet we get mired down with variables leading to lengthy delays, then ultimately leaving us with nothing as the end result. From the former uptown parking garage to the scarred waterfront once with promise of the Noah Hotel, now a vacant lot collecting graffiti and trash. Had a long range plan been in place for the City of Kingston some of those hurdles may have been avoided and the outcome much different from what we have today including more super sized drug store chains. Getting through difficult issues on a day to day basis is not working. This approach is not successful in life, and it doesn’t work in government either. Shortsighted planning has no benefit, especially for the future of our City and what we leave to the next generation of our children who we hope can stay here, earn a living and raise their families too. It affects every aspect of our City’s well being. It seems obvious that many of our City’s woes stem from the erosion of our tax base, lack of well paying jobs and the steady decline with quality of life benefits. To turn this trend around I believe the first line of defense would be to ask that a long range planning committee be formed in order for us to identify what is needed to create a 25 – 30 year plan on how our City grows into the next generation. In it we can explore how we grow our business zones, protect historic districts and quaint neighborhoods, all while keeping a healthy balance, and an eye on environmental responsibility. One of the things that people love the most about our City is our heritage, yet we do nothing to protect it, in fact it seems that even the provisions in place are not enforced. Not only is this an important task to insure our City’s character, it is an untapped source of revenue which will strengthen our financial footing as well. Perhaps the Economic & Finance Committee should form a task force designed to look at our City’s Codes and Laws and update them to reflect today’s living standards, incorporating ways to create revenue at the same time. A simple permit fee to remove a shade tree could create funding for much needed sidewalk rehabilitation. As it is now, the $250 fine when a tree is removed without a permit is not enforced…you do the math. Simply enforcing our codes can provide a revenue stream which can help restore many of the services to our residents which seem to dissipate on a daily basis. Part of this plan needs to include public safety for pedestrians and bicyclists which will also encourage less motor vehicle traffic in our urban areas. This is just one of the many issues that come to mind so let’s move on to the next topic. Efficiency (and Planning) will be what pulls us through. The current union contracts are crippling our City where ALL parties need to rethink everything from the ground up. This may not happen until contracts are open at the end of next year, but it MUST happen. Looking at how things are done now and how things should be done efficiently in the future, which include the merging of services has to be our plan in order to sustain the City without the unlawful burden on the taxpayers. We ask that union leaders understand the challenges that we face with the budget process in the upcoming months. The unity of working together is the only solution that will keep us stable. Cooperation from every component will make the difference between survival and bankruptcy. Other departments also need to be realigned in order to reflect tomorrow’s government model. Economic Development needs do more than secure grant money. Instead let’s come up with an outline on how to encourage small business with tax incentives and perhaps outline areas that could benefit from programs that attract these small businesses. Let’s give them a reason to come here. The last issue that we need to address is crime, quality of life, and the confidence our residents have in us to provide it for them. Our police department works hard fighting to keep our streets safe and gang activity at bay, not an easy task. The City needs to stay on solid ground in order for us to turn this trend around and take back our neighborhoods. Fighting crime is important, just as important is engaging our young people early and giving them something to do instead of getting into trouble. Continually cutting programs that offer these options for them is backwards thinking. Funding police, very important, but we also need to take steps in prevention and this is where the cuts from the Recreation Dept. become the issue. These programs provide a safe place for them to grow, play and learn. Cuts from this department show in the deterioration of our City Parks, their Programs, and the mental well being for all our residents young and old. There are great things coming with new faces on our Common Council, looking at things with a new perspective for change and expecting accountability. I also want to compliment the Mayor & the City’s Comptroller for uncovering overages in what we spend in Safety Net funding. This action can save us millions of dollars in the future. By working together without party lines getting in the way of progress and compromise we can hopefully turn a corner and see positive change. We also need do a better job of letting the community know what is happening in City Government. Let’s encourage the flow of information by setting up a Kingston311.com information website. It’s based on NYC’s information hotline where residents can ask questions on things ranging from City Codes to Recycling Schedules. We don’t have the funding for a hotline, but a website with vital information would be a welcome resource for our Citizens without much cost and could even become a source of income in the future. In summary, we need to look at the Big Picture from top to bottom and re-think how things are done with a long range plan. Without it we have nothing, no public safety, no funding for police and fire, no infrastructure, no technology, no youth programs, no business…All of these components lay the foundation for economic stability ending our financial crisis. Planning and Efficiency is our mantra. If done right we will see a stronger community with less spending, more revenue which ultimately leads to lower taxes. We will have a City which offers quality of life for its residents, economic strength for our businesses, and a solid and affordable education for our children. We look forward to working with all members of the Council and Administration towards this goal. The city of Kingston is the Jewel of the Hudson. Let’s put some polish on her and make her shine. This just in! I am so happy to learn of the news, as that play area is really beautiful and completely underutilized. DEP volunteers launch initiative at YMCA playground that includes creating community and children’s gardens. Employees from the New York City Department of Environmental Protection office in Kingston have volunteered to clean up the YMCA playground as well as install a community garden and children’s garden at the site, which is behind the YMCA building on Broadway in Midtown. The coordinators are conducting the first cleanup this Saturday, April 10 from 9 a.m. to 1 p.m. and need community volunteers to help. The work involves making repairs to the jungle gym as needed, cleaning up trash at Summer and Susan streets, and removing brush, dead limbs and trees as well as removing invasive plants. Additional cleanups are also planned in the coming weeks. For more information about the clean up as well as to help out with the garden project, contact Ed Blouin at eblouin@hvc.rr.com or by calling him at (845) 616-2677. For more information about other community garden projects in Kingston, contact Arthur Zaczkiewicz of the Kingston Land Trust at zaczkiewicz@yahoo.com.